SPRING HEAD SERIES- 3 RACES IN ONE – 12, 19 & 20 MARCH. Entries are now open. Clubs are invited to make entries using the form below. Crews can enter events on just one, two or all three days. Payment is available on line. The closing date for entries is 5TH MARCH at 9.00 pm. We are particularly keen to encourage entries from Junior and Masters Crews. Two courses are available – 3200 m and 2200 m. All events are available in both the long and short courses. The Head races are run over two courses of 3200 metres from Lemons Hill Bridge to Alton Rowing Club’s Clubhouse and 2200 metres from Lemons Hill Bridge to ‘The Green Buoys’ which is the most sheltered part of the course and therefore most suitable for Novice and Junior crews. All classes of boat and crew status are catered for. There are four divisions starting at 10.00 am and 1.00 pm. Division 2 (Short Course) will follow on immediately from Division 1 and Division 4 (Short course) will follow on immediately from Division 3. Therefore, there doubling up in Divisions 1 & 2 or 3 & 4 is not allowed. However, you can race in different events in Div 1 and 3, or Div 2 and 4, for example. Please click on the link to find the starting order. 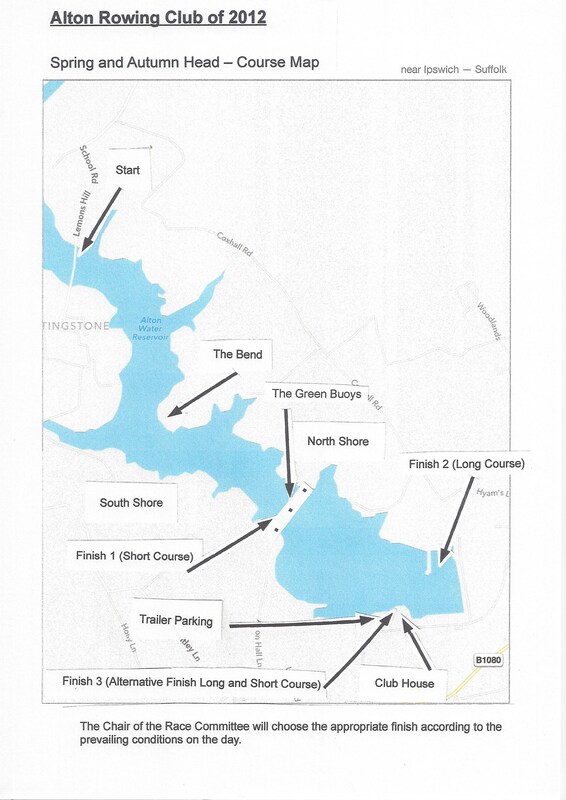 Held under the Rules of the GBRA and organised by Alton Rowing Club, our Spring Head Series will be held at Alton Water, Holbrook Road, Stutton, Suffolk, IP9 2RY over a distance of 3,200 metres and 2,200 metres on 12, 19 & 20 March. Crews can enter for 1, 2 or all 3 days. Entries are to be made using the form below. The fee per seat is £15 per racing seat (Coxes Free) if racing on two or three days. £ 10 per seat (coxes free) if racing on just one of the days. If racing on one day only, clubs should make the entry as per normal and pay the £ 15 entry fee. ARC will then refund the extra £ 5 after the race. All entry fees must be paid before the draw is made or crews may be rejected. However, if accepted the club will be liable for the entry fee. The draw will be made on Sunday 6th March at 6.00 pm. Crews withdrawn after entries close will not be given a refund and will be liable for the full entry fee. Entries close on Saturday 5th March at 9:00 pm and the race order will be available on our website by Wednesday 9th March. Course inspection will take place the day before each event and at 7.00 am on each day of the event. Crews are advised to contact 07977 059022 before departure to gain the latest update on water conditions if they have any concerns. Please note that there are contingency plans in place in the unlikely event of adverse water conditions in order for the event to proceed. 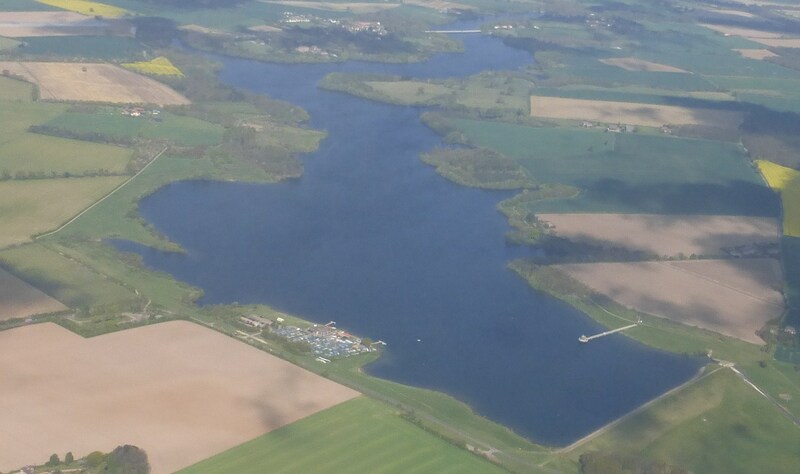 ALTON WATER – The Start is at the top of the photo, the finish at the bottom.